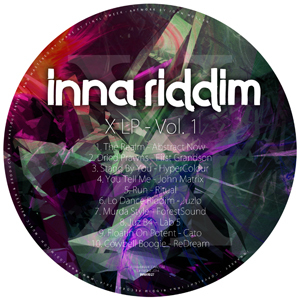 The first of two celebratory albums of brand-new tracks, Inna Riddim X LP Vol. 1 features ten tunes by ten different artists, to mark ten years of Inna Riddim: bass music across the spectrum of styles, tempos and moods. Abstract Now’s ‘The Realm’ sets the tone for quality with slinky, compulsive breakbeats overlaid with a hallucinatory incantation; First Grandson veers into jazzier territory with ‘Dried Prawns’, reverb-drenched chords floating over rollicking, off-kilter lo-fi drums. Then it’s dancefloor mayhem with ‘Stand By You’, a massive track that demands to be played on a rig of a size to do Hypercolour’s euphoric vibes justice. Next up, John Matrix plunges us into darkness with ‘You Tell Me’, a sparse but lethal chunk of half-step with plenty of grunt and corrugated bass, opening the way for Ritual’s ‘Run’, a tense and frenetic juke/dnb workout underpinned by a menace that leads nicely into Juzlo’s instrumental grime number ‘Lo Dance Riddim’, with dramatic strings and a deadly pulsing bassline; a moody series completed by ForestSound’s distinctively stripped-back approach to drum&bass on ‘Murda Style’: an irresistible rhythmic attack augmented by horror FX and rolling toms. Then, like a sun breaking over the horizon after a stormy night, Lab 5 drops the BPMs and lifts the mood with ‘Juz B4’, all languorous pads and sinuous synth lines. Next, Cato throws down a funky 4×4 beat with a touch of attitude and an insistent hi hat tattoo on ‘Floating On Potent’. ReDream rounds the LP off with the polyrhythmic ‘Cowbell Boogie’, a percussive tour de force with a light touch perfectly balanced by just a touch of nasty bass growl.